I don’t think I’m the kind of person anyone really imagines would read Lev Raphael’s story collection Secret Anniversaries of the Heart. Or perhaps I should say, when the marketing department at Leapfrog Press got together (I’m imagining a couple of guys and a six pack) to discuss their target audience or likely readership, I probably didn’t make the list. There is some justification for this—the overwhelming reason people like a book is because they like, or think they are like, or perhaps wish they were more like its main characters. It was one of my greatest hurdles when I was a bookseller—trying to convince people to read a book about somebody they didn’t think they would want to know. Secret Anniversaries of the Heart is a strongly-themed collection of stories that deals with issues of Jewish identity, the loss and finding of faith, growing up in the shadow of the Holocaust, coming of age and homosexual identity, and the insidious nature of anti-Semitism and homophobia. These are stories about what it is to be Jewish in a culture that consigns Jews forever to the realm of the exotic and foreign. What it means to be religious in an era that is materialistic and spiritually barren. What it means to be homosexual in a country where the veneer of tolerance is sometimes as thin as the membrane around the yolk of an egg, and what it means to live in the shadow of a horror so great its victims will never again be at peace. These stories explore what it is to be a young, gay, Jewish, and the child of Holocaust survivors. I am almost none of those things. I was raised solidly middle class. We weren’t religious. When I asked my parents about God, they told me I could decide what to believe when I was older and made up my own mind—as if belief in God was simply a scientific theory to be proved by the weight of the evidence. We were blandly free of religious identity, ethnic identity, and all the rituals that accompany such self-definition. My father managed to avoid the draft in perfectly legal ways. There were no horrors in my life or theirs. No past shadows blocking out the present sun. In fact, I am very much what various characters in Raphael’s collection refer to as typical Amerikanski—a generic group of privileged, spoilt people who have no idea what real trouble looks like. The only things I have in common with any of the protagonists of the stories are a general love of literature (several of the characters in the book are fixated on Henry James or Edith Wharton in a way that I can wholly appreciate) and the fact that I’m gay. But that last isn’t as strong a commonality as you might think—I can empathize with the young men in Raphael’s stories as they come to terms with their awakening sexuality, but the strong thighs, large hands and wide shoulders they desire don’t exactly float my boat, you know? The finer points of male beauty are usually lost on me. I have the same reaction to a group of men that I do when having to pick out a pair of sneakers—none of them look any better than the others. They all just look like sneakers. The impressive thing about Secret Anniversaries is that none of all that matters. This is, among many other things, simply good fiction and like all good fiction it breaches our self-imposed limits and identities and truly lets us into another person’s life. Which is, after all, the whole point of fiction. Each new story turns another facet of the characters’ quest for identity to the light. “Doesn’t it bother you?” asks one young man of his lover “pretending to be something that you are not?” He is talking about the fact that there is a Christmas tree in the hall, not that they are gay. One doesn’t need to be gay to understand the breathless desire some of the young men feel for their college roommates. One doesn’t need to be Jewish to feel the sense of peace some of the characters find in Temple rituals and prayers. And readers certainly don’t have to have a connection with war to feel the suffocation of living with such a horror as the Holocaust constantly in the background—rarely mentioned but always present. The author sees to it that the reader feels all these things, viscerally. He is too good a writer to let his readers off the hook with platitudes. But he is never dogmatic. Raphael leaves it to the reader to see, for example, the uncomfortable parallels between anti-Semitism and homophobia. He rarely lectures, despite the fact that many of his characters are university students with the penchant for political speeches young students often possess. (Students come off rather well in his stories—I suspect he has a kind of affection for young people all excited to learn things). But we are left with no illusions about the damage such hate can cause—both the institutionalized and the internalized forms. One of the common themes among all the stories is how people attempt to heal the internalized scars and shame that come from living under persistent fear and hate. In a few stories they fail, and violence erupts suddenly. It is all the more startling and frightening to the reader because when it happens it isn’t gay-bashers or skinheads who end up causing the most harm. That would be easy and clean. Instead, it is almost always a result of someone’s internalized shame exploding outwards with deadly impartiality. The young man, his family, his lover and a few Amerikanski who happens to be in its path all suffer for it. 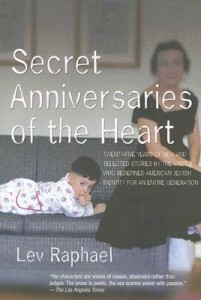 For all its dark themes and explorations, though, Secret Anniversaries of the Heart has an optimistic feel. I hesitate to use the word “redemptive”, but there is certainly a strong faith in the stories that some things do triumph. Love, for example. The young men and women (there are a few stories told in a female voice) who decide to pursue these questions of identity despite resistance from their families, or the obstacles of unspoken past horrors, seem to draw strength from even beginning the journey. It isn’t always an easy path, but it is always better than refusing the quest. In the spring of 1974, I was eight years old. Every morning I walked about a mile to school, through city neighborhoods and crossing three busy streets, including one six-lane highway. Every afternoon I walked back. Now, my mother and I just shake our heads at the folly of it. It was a different world back then. A safer world where a little girl could walk to school without the fear of drugs, violence, or being snatched by strangers. In the spring of 1974 Virginia Holman was also 8 years old, and one morning while I was probably tripping blithely towards school, she and her little sister were packed into the family car by her mother. But while everything was right in my world, young “Gingie” could sense that things were not right in hers. Her mother was happy, ecstatic, even- about the prospect of going to the family cottage on the Virginia Peninsula. She seemed filled with a sense of mission, which made sense, since she believed that she had been inducted into a secret army and given orders to turn the cottage into a field hospital in preparation for an imminent war. As I would have been negotiating the six lane highway between me and my second grade class, Gingie was negotiating with a mother held in the thrall of a full-blown psychotic episode. For the next three years, while family, friends and neighbors turned a blind eye to the situation, she helped her mother make preparations, endured “night maneuvers”, and took care of the baby sister her mother had all but forgotten. Her mother’s mission required that all the windows in the cottage be painted black. Gingie’s mission was to cope with her mother’s paranoid and delusional reality. Amazingly, there was a father, who knew where his family was the entire time. A workaholic in a high-pressure job in Richmond, he chose to believe that his wife was simply “resting” at the family cottage, and stayed in the city. It was nearly four years later before relatives finally stepped in and decided something was very wrong. (An aunt, having just seen the film Amityville Horror suggested an exorcism). The father finally took his wife to see a doctor, who immediately had her institutionalized as a schizophrenic. 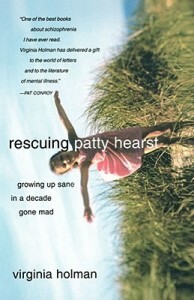 She has been in psychiatric care ever since. Young Virginia was left with the wreckage of her family. Incredibly, she condemns no one, although surely she could indict everyone- mother, father, an entire society, for the ordeal she and her sister were made to endure. Instead, as an adult she was reluctant to tell the story at all, because of the pain it would cause herself and her family. It is agonizing and awesome to read such a horrific story, written so beautifully. The book jumps between the present and the past as her mother tilted between delusion and lucidity, and Holman herself vacillates between fear, compassion, and -incredibly- humor. One of the most frightening and moving moments occurs late in the story, as she is going through the attic looking at family memorabilia as she tries to convince herself to begin writing this book. Suddenly she hears music, and goes cold with fear. You or I may have assumed that someone had turned on a radio. But the author is all to aware that schizophrenia can be hereditary—she is frightened of unexplained sounds and voices, having been at the mercy of the voices in her mother’s head for years. When her husband tells her he did indeed turn on a radio, she all but weeps with relief.